LaneOne delivers a premium experience beyond just a ticket to the show. 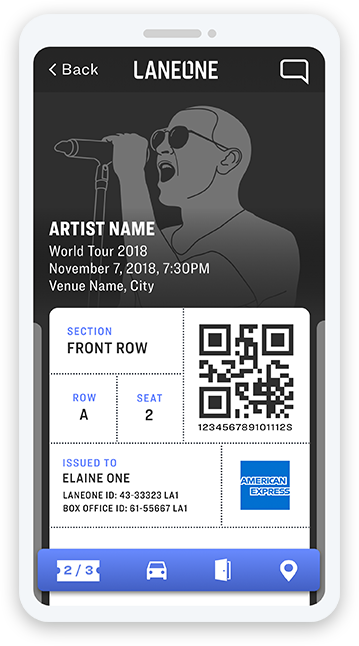 Each LaneOne ticket includes access to the best seat locations and a mix of benefits that vary by venue, including transportation or parking, preferred entrance into venue, food & beverage options, as well as dedicated real-time personal ambassadors via in-app chat to help make your night the best it can be for any needs before, during, and after the show. Every ticket that includes this benefit will get up to a $50 credit for a round-trip ride to and from the venue or a preferred parking spot. Just book a ride from the LaneOne app and your destination will be pre-set. When you arrive at the venue, proceed to the LaneOne preferred entrance. The seat was amazing and the separate entrance saved me much time and hassle. Unbelievable deal...I felt like a member of the band! LaneOne has partnered with major venues to provide our customers a LaneOne preferred entrance to avoid the crowds regardless of whether you arrive early, late, or on-time. The app will show you where the entrance is at the venue. If you prefer to enter through another entrance, that's fine too; your barcode will work the same wherever you choose to enter. Dang They hooked yall up. Every ticket that includes this benefit will get access to a premium hospitality space, a dedicated bar, or other food & beverage options specific to the venue. Exact service subject to availability. I love LaneOne so much! Best decision of my life. hands down! Thank you for giving me the most incredible night of my life! It was a night I’ll never ever forget. Every LaneOne experience begins with a great seat. We bring you access to some of the best seats in the house; to the best acts in the world; at the finest venues in North America. LaneOne partners directly with artists and venues to get you exclusive access to official tickets. You are the first and only buyer of every ticket purchased through LaneOne. LaneOne strives to give you more for your money - and greater peace of mind - than tickets sold at similar prices on unofficial secondary or resale markets. Have questions or need help? Message us in the app via the real-time in-app chat, and your LaneOne Ambassador will assist you. We want your experience to be smooth, stress-free, and enjoyable and will do whatever we can to make it so; before, during, and after the show. Every part of your experience is powered by the app; tickets, ticket transfers, transportation credit, directions and maps, food & beverage options, and customer support.